Glacial bays are extremely noisy marine environments, mainly because of the melting of marine terminating glaciers [1-3]. Tiny air bubbles bursting explosively from the ice during contact with warm ocean waters are responsible for these signatures. One of the most noisy and spectacular phenomena are also detachments of large icebergs at the ice-ocean boundary, called glacier calving events [4-5]. Both processes are particularly active during warm conditions in the Arctic summer and early autumn. When the air temperature drops, the water cools down and after some time a thin layer of sea-ice appears. But even then, the underwater environment is not always a quiet place. Researchers found it a few decades ago during field measurements far in the north. A large number of acoustical studies concerning sea-ice processes appeared in the 1960s. 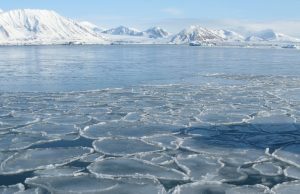 Results from field campaigns clearly showed that underwater noise levels recorded below the ice depend strongly on environmental conditions and the structure of ice itself. For example, sea-ice cover cracks during abrupt decrease in air temperature and deforms under the influence of wind action and ocean currents [6-8]. The noise levels measured in winter were often similar to those observed at open sea with wave heights reaching up to 1.25 meters . Conversely, when the ice is strongly consolidated and thick enough, recorded noise levels can be much lower than those typically observed during completely calm conditions .However, most of these findings based on acoustic recordings carried out very far away from the ocean shore. The question is: Should we even care about sea-ice conditions in much shallower regions, like small Arctic bays? Now, we are all experiencing climate shifts that lead to disappearance of sea-ice. Without ice formed close to the shores, coastlines are directly exposed to the destructive action of ocean waves . This, in turn, poses a serious threat to settlements and infrastructure. It is therefore important to monitor sea-ice evolution in shallow areas, including both the degree of consolidation and phases of transformation. I am addressing these questions by showing the results of several experiments, conducted in Hornsund Fjord, Spitsbergen, in order to find acoustical characteristics of different types of ice. Sea-ice was present in various forms during the whole field campaign, from a thin layer through rounded chunks (pancake ice) and finally consolidated ice cover (Fig. 1). Fig. 1. Different forms of sea-ice have different sound signatures. A photograph taken at the study site, in Hornsund Fjord, Spitsbergen, close to the Polish Polar Station. Recorded underwater noise levels changed periodically together with a tidal cycle. For consolidated ice cover, the highest noise levels occurred suddenly at low water, when underwater rocks are crushing the ice (Mov. 1; Rec. 1). Another scenario takes place for relatively thick ice pancakes. They are packed together when the water is low, but the spaces between them begin to grow during the high tide. With additional wind or current stress, chunks of ice can easily collide and thus produce low-frequency, transient noise (Rec. 2). Finally, for thinner pancakes or freshly formed ice cover, we can hear the loudest sounds when the water is going down. Chunks of mechanically weak ice are squeezed together, leading to deformations and consequently highest underwater noise levels at low frequencies (Fig. 2; Rec. 3). In some cases, stresses acting on ice are not crushing it, but produce sounds resemble a creaking door (Rec. 4). The results prove that different types of sea-ice react differently for tidal movement, and we captured these differences by acoustic recorders. This relationship can be used for long-term studies of sea-ice conditions in the shallow Arctic bays. The environments, where ocean tides serve as a conductor in the underwater icy concerts. The work was funded by the Polish National Science Centre, grant No. 2013/11/N/ST10/01729. Fig. 2. Noise levels at low frequencies are much higher when the water is going down (see red frames). Mechanically weak sea-ice cover is squeezed and leads to large deformations and break-up events. 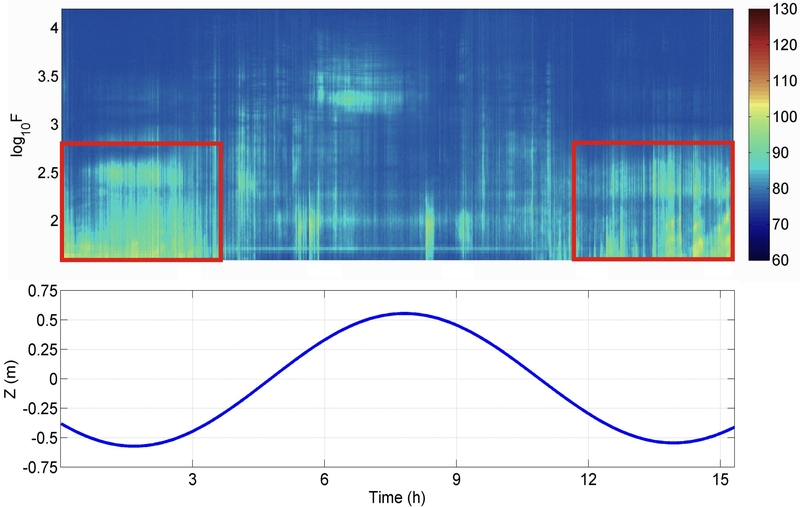 The upper plot presents a spectrogram of the acoustic recording lasting more than 15 hours. Brighter color indicates higher noise levels. Time is on the horizontal axis, and frequency in logarithmic scale is on the vertical axis. A value of 3 is a frequency of 1000 Hz, while 2 equates to 100 Hz. The lower plot presents modeled data, corresponding tidal cycle (water level change) for the study site. Mov. 1. Ocean tides lead to huge deformations and break-up of the sea-ice cover. Time-lapse video from Isbjornhamna Bay, Hornsund Fjord, Spitsbergen. Rec. 1. The sound of sea-ice brake-up caused by underwater rocks during low water. Rec. 2. Transient noise of colliding chunks of ice during high water. Rec. 3. The sound of deforming ice, which is squeezed when the water is going down. Rec. 4. 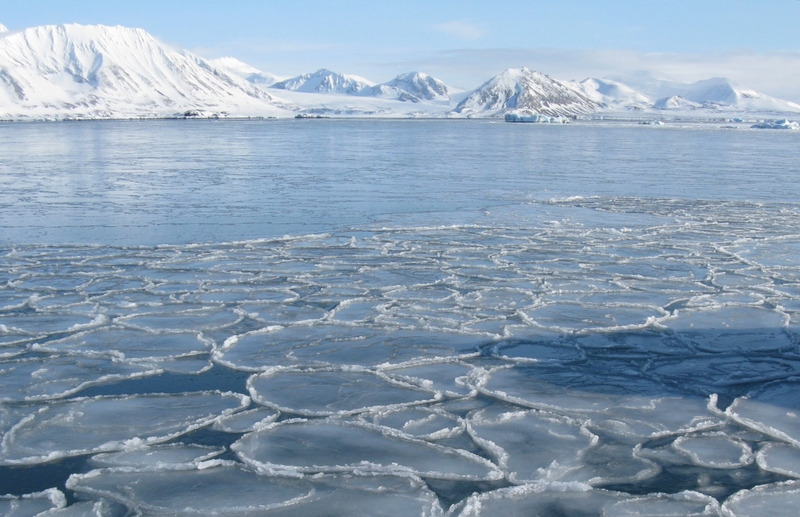 Sometimes sea-ice processes sound like a creaking door. Tegowski, J., G. B. Deane, A. Lisimenka, and P. Blondel, Detecting and analyzing underwater ambient noise of glaciers on Svalbard as indicator of dynamic processes in the Arctic, in Proceedings of the 4th UAM Conference, 2011: p. 1149–1154, Kos, Greece. Pettit, E. C., K. M. Lee, J. P. Brann, J. A. Nystuen, P. S. Wilson, and S. O’Neel, Unusually loud ambient noise in tidewater glacier fjords: A signal of ice melt, Geophys. Res. Lett., 2015. 42(7): p. 2309–2316. Deane, G. B., O. Glowacki, J. Tegowski, M. Moskalik, and P. Blondel, Directionality of the ambient noise field in an Arctic, glacial bay, J. Acoust. Soc. Am., 2014. 136(5), EL350. Pettit, E. C., Passive underwater acoustic evolution of a calving event, Ann. Glaciol., 2012. 53: p. 113–122. 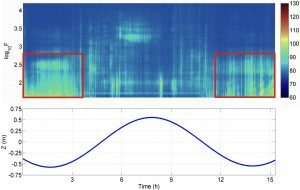 Glowacki, O., G. B. Deane, M. Moskalik, P. Blondel, J. Tegowski, and M. Blaszczyk, Underwater acoustic signatures of glacier calving, Geophys. Res. Lett., 2015. 42(3): p. 804–812. Milne, A. R., and J. H. Ganton, Ambient Noise under Arctic-Sea Ice, J. Acoust. Soc. Am., 1964. 36(5): p. 855-863. Ganton, J. H., and A. R. Milne, Temperature- and Wind-Dependent Ambient Noise under Midwinter Pack Ice, J. Acoust. Soc. Am., 1965. 38(3): p. 406-411. Milne, A. R., J. H. Ganton, and D. J. McMillin, Ambient Noise under Sea Ice and Further Measurements of Wind and Temperature Dependence, , J. Acoust. Soc. Am., 1966. 41(2): p. 525-528. Macpherson, J. D., Some Under-Ice Acoustic Ambient Noise Measurements, J. Acoust. Soc. Am., 1962. 34(8): p. 1149-1150. Barnhart, K. R., I. Overeem, and R. S. Anderson, The effect of changing sea ice on the physical vulnerability of Arctic coasts, The Cryosphere, 2014. 8: p. 1777-1799.